Enthusiastic and extended applause greeted the new archbishop then he acknowledged their gift of prayer. 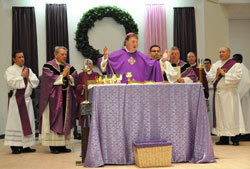 At the beginning of Advent, the archbishop said, the word of God asks the Church to be especially alert. The anxieties of daily life can distract us, Archbishop Tobin said, and even suffocate the spark of our faith. Catholics must be an active part of the Church community, listen to God’s word often, participate in the sacraments and help others in need, the archbishop emphasized, in order to keep our hearts open to the Lord. Archbishop Tobin also invited the young people at the Mass to “keep the eyes of your hearts open for a special message that God might be sending to you. After requesting the people’s prayers for his new ministry and promising to pray for them, Archbishop Tobin said he has asked “Jesus to make me a shepherd after his own heart that I may carry out the mission that has been entrusted to me—this mission in central and southern Indiana.